Wow whatta surprise!! I first made this for my husband for Father's Day, served it outside with all his favorite ice creams hidden inside. It was easy to see the kid inside when his eyes lit up like the sparklers that were on top. And it's not as hard as you might think, don't be afraid give this a try and everyone will love you for it. Large round cake pan with a corresponding large bowl-so they're about the same size. Brownie mix, or make a patch from scatch. Select at three of your favorite ice creams. Egg whites, cream of tartar and sugar. A day or two in advance you line the large bowl with saran wrap and layer in your first ice cream. It's best to let the ice cream soften a little before you start to layer. Cover with some saran wrap and put the bowl back in the freezer until it hardens up. Remember to remove that little layer of saran in between the ice cream layers each time. Repeat these steps with as many ice cream layers as you like, the more you do the more exciting it looks when you cut into it later. Now it's time to whip up a good amount of meringue. 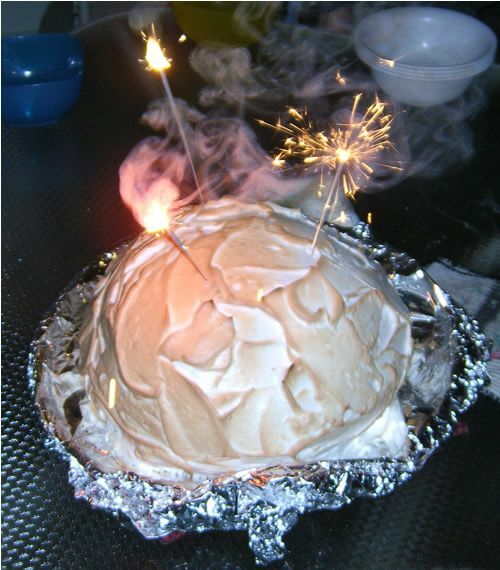 It's really important to completely cover the ice cream and the brownie layer with the meringue, otherwise the inside of your oven may be covered with melted Baked Alaska ice cream.